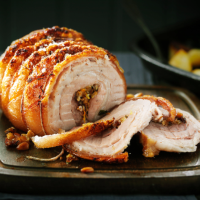 A cross between a British roast and an Italian porchetta (rolled belly and loin which is stuffed), this makes for a knock-out Sunday lunch. Also delicious served sliced in crusty rolls smothered with garlic mayonnaise. 1. For the stuffing, fry the sliced onion and fennel in the oil for 10 minutes, partially covered. Uncover and cook for 15-20 minutes, stirring often, until very soft and caramelised. Add the herbs and garlic and cook for 2-3 more minutes, then stir through the breadcrumbs, pine nuts, raisins and citrus juices; cool completely. 2. Meanwhile, make the fennel citrus salt: crush the fennel seeds with the salt in a pestle and mortar until finely ground, then stir through the citrus zests; set aside. 3. Preheat the oven to 150˚C, gas mark 2. Sprinkle the fennel citrus salt over the flesh side of the pork belly, then spread over the stuffing, leaving a 2cm border of exposed meat. Tightly roll the joint widthways and tie securely with butchers’ string (see our Food’s Top Five page). 4. Generously season the outside of the pork and place in a large roasting tin on top of the roughly chopped onion, carrots, celery, the halved garlic bulb and apple. Pour in the wine and citrus juices, then roast for 2 hours 30 minutes, until the meat is tender. 5. Remove the pork from the oven and heat the grill to high (about 250˚C). Place the pork under the grill for 3-5 minutes, watching it carefully and turning if necessary (use a carrot or onion to prop it up), until the skin crackles and puffs up. Remove the joint to a plate and rest under foil for 20-30 minutes. 6. For the gravy, pour off and discard the excess fat from the roasting tray. Place the tray over a high heat on the hob. Stir in the flour and cook, stirring, for 3-4 minutes. Add the stock and boil rapidly until reduced by half, then sieve into a clean saucepan. Season and boil rapidly for 10 minutes, or until you have a thick gravy. Serve alongside the sliced pork belly, with mash and vegetables, if liked. Or splash onto rolls, spread with garlic mayo and serve filled with pork and rocket. This recipe was first published in Sat Nov 01 17:38:00 GMT 2014.